Your business 1300 number. Do it your way. How do I manage my 1300 number? Modern businesses need manageable, flexible and scalable solutions. A 1300 number gives your business the leading edge of better call management, the flexibility to customise your number, while giving your business the professional appeal that helps you reach more customers. Backed by years in the industry, 1300 Numbers Australia has streamlined set up processes and simplified account management. Whether it’s accessing call records, paying your account, or logging a support request, our team and systems are always available to support your business needs. Can I access my inbound call records online? When you become our customer, you will gain access to your online customer portal. This is a secure online account management interface that allows you to make service change requests, access reports, update your account information and pay your bill. Inbound call reports that you can count on. 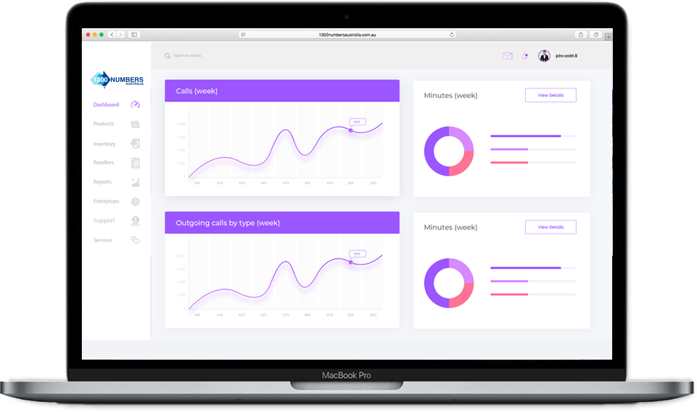 Every month, we will send you an inbound call summary of your 1300 number incoming calls, where they came from and even your busiest time of day. This will provide your business with the insights you need to help you with resource management or tracking sales campaigns. Using our online customer portal, you can access call data and graphs that provides greater insights to your business incoming call activity. Paying your 1300 number account. All customer accounts are paid by automated monthly direct debit. If you prefer to pay before your scheduled direct debit date, simply log into your customer portal and make a payment online. Changes to your direct debit or payment details can also be made through the self-service customer portal. If you encounter difficulties paying your account, contact us on 1300 50 10 50 to make a payment arrangement and view our Financial Hardship Policy for further information. Simple tools. Better service. Flexible numbers.